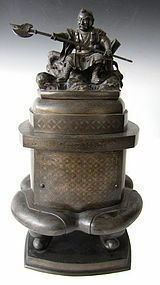 Beautiful Japanese antique Buddhist temple bell made of bronze or brass with repousse design of scrolling vines and chrysanthemums, long double-linked chain of hand foraged copper, both chain and bell all with lovely green patina, Meiji Period. 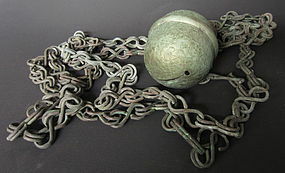 Size: approximately 75" long including chain when hanging. 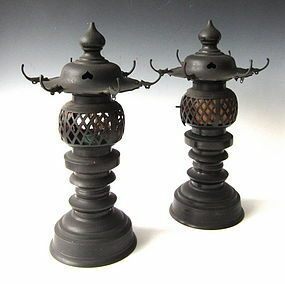 A pair of bronze temple lanterns with a cross pattern design in the section where the light would be placed. 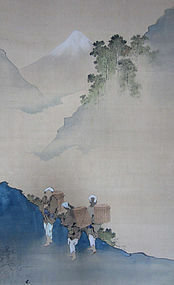 The pair may have been used in a small shrine within a temple altar complex. 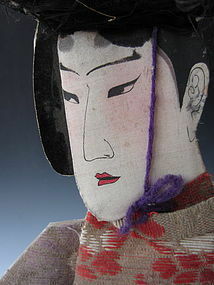 Age: 20th century. Size: Height: 15" Diameter: 8.5"
A Japanese gilt copper hanging lantern decorated with engraved motifs of scrolling clouds, waves, and vines. 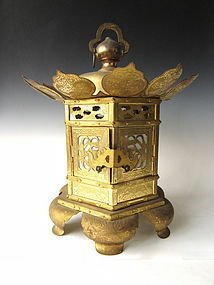 The bottom contains a six petaled flower like design. 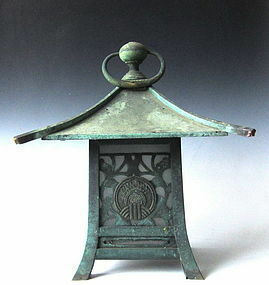 The feet of the lantern is known as neko ashi, or cat legs, which is often seen in Japanese designs.Age: 20th century. 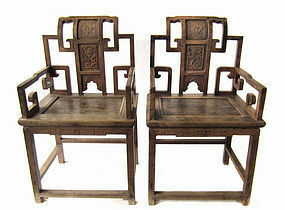 Size: Height: 17.5" Diameter: 14.5"
Pair of antique Chinese arm chairs, made of a very smooth hardwood, beautiful open work large key fret motif on backs and arms, each back rest is carved with a bat and crane, 19th century. Size of each: 40 3/4" high x 24" wide x 19 1/2" deep. A bronze statue of a fisherman about to cast his fishing net into the water. The statue is well crafted showing the veins on the legs, the knitting on the nets, every piece of straw on the dress. This meticulous detail work in Japanese bronzes is often seen during the Meiji Period. The bottom of the statue contain two inspection labels.